To accept or regard something as truth (from Merriam Webster). What did April bring in terms of believing? Well, lots of moments that I didn't believe, really. It's easy to believe when life is easy and good. But it's more than 10 times harder when life is tough. And it's in those moments, that I come to a point where I can either believe or I can doubt. That "can" part implies an option. And this month I realized that faith is completely a choice. I can choose to believe and choose to doubt. I can choose to grow or I can choose to stand still and let my emotions get the best of me. And I can choose Jesus or I can choose sin. This month, many of my choices were made in times of weakness, and in those moments, I chose sin over Jesus. I chose negativity instead of hope. And I chose doubt over belief. Which is why I'm so grateful for second chances. And the chance to re-do my choices. And today, I choose Him. What did/do you believe this month? 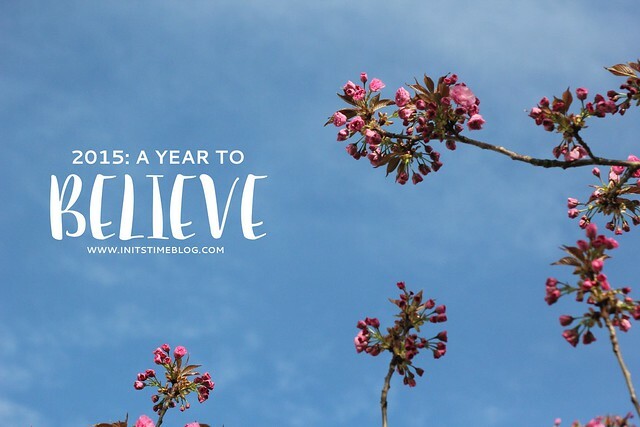 Do you still think about your word for the year and/or resolutions for 2015? My word for this year was Intentional. I have not been doing very well lately. Hopefully May will be better. Kiki, I know you didn't, but I feel like you wrote this for me! I had a pretty major emotional breakdown yesterday and let my emotions get the best of me. I had bottled things up for a while and then exploded. I turned to self pity, thoughts of doubt and disbelief. I am so thankful for God's redeeming love. Without Him, I couldn't get through. Thanks for this gentle reminder, Kiki! It seems like a lot of people (including me) are having a rough month of it. Hopefully May showers bring peace and less stress ;) I definitely choose negativity over hope many times, and it's something I'm slooowly working on. I would agree! It's unfortunate, but it is relieving to know I'm not in it alone. I hope that May brings peace and less stress, too! Sorry to hear that you've been having a rough month as well. And I am constantly working on choosing hope over negativity--it's definitely something that is a work in progress! I have! She does so much better on being intentional than I have. I'm trying to get back on the bandwagon. And I love your word for the year! How have I not heard about it until now? You're definitely living it out in your blog comments and presence--your words and always so heartfelt and encouraging! the whole point of the gospel is that Jesus came to save sinners. praise God we are redeemed and covered in grace and mercy. Amen right back at you! :) Seriously though, it's amazing just how forgiving God is. He surprises me because just when I thought I was at my lowest, He'll sweep me up and pick me off my feet. So grateful for grace!! !